The following article by Peter Duker and accompanying photos are taken from a 1977 issue of International Cycle Sport and are reprinted without permission. The magazine itself folded many years ago. If anyone knows the copyright holder and they have an objection I will, of course, remove this page. THE Headquarters, or Permanence, of this, the oldest of the Classic Races (1892), is somewhat different from those to which we have become accustomed. Instead of cold, heartless offices, there is the warm hospitality of the "Taverne Sportive" in the very centre of Liège. The general public are welcomed, and they arrive in force, but nevertheless every- thing is carried out there in the friendliest way in the world. I feel that I must mention that the distribution of necessary documents was the fastest that I have ever experienced. Quite honestly, isn't it so simple to put all the relevant papers into one envelope or briefcase and just hand it over to the accredited person? During the night, previous to the race, the rain fell like there was no tomorrow, but a watery Walloon sun attempted to wrest a few more degrees out of the wakening city as we made our various ways to the hub of events. There was an agreeable lack of the ghastly accordion music that appears to be necessary at all French promotions as riders appeared and signed on in the comfort of the pub, and in case the reader who last year complained that I spent more time describing the drinking facilities at races than I did in providing information on individual gear ratios, is still with us, then I will inform him that I had three glasses of white wine for breakfast, and the winner's top gear was 53x14!! The start itself was a bit chaotic, but by the time the enormous entourage had gone through the two underpasses out of the city everything appeared to be under control. and we were off on our day in the country. After 20 miles I cut through to the feeding station at Vielsalm (138 km) to have a quick chat and a glass (are you still there?) with Sherriff Bill Woodul, who was my companion in last year's Tirreno Adriatico, and has evidently started a reverse Brain-Drain from the United States to Europe. 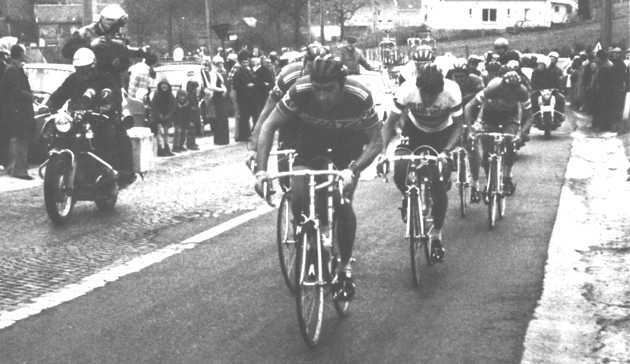 Merckx leads world champion Freddy Maertens in pursuit of Hinault and Dierickx. The terrifying climb of the Stockeu started the Big Ball rolling. Each one of "The Kings" sent a courtier out to test the opposition. Pollentier (Maertens), De Witte (De Vlaeminck), and Bruyere (Merckx) got loose here by a mere 15 seconds, but at the top of the Haute Levee (162 km) these knaves had doubled that sum over their following Rulers, and it was just here that Godefroot and Peeters paid so dearly for their earlier efforts. I was alongside Godefroot as he almost stopped dead in his tracks, the strength whistling out of his body. Just ahead, Jan Raas was in serious trouble, and there was obviously going to be no repeat of the Amstel Gold Race here. Even Bernard Thevenet could produce nothing to counteract the climbing prowess of the men who were finally to make the morning's headlines. On these Ardennes climbs it is not a matter of racing up them, it is simply being able to get up them at all!! Forward movement falls to almost zero as sheer brute force takes over from athletic elegance. 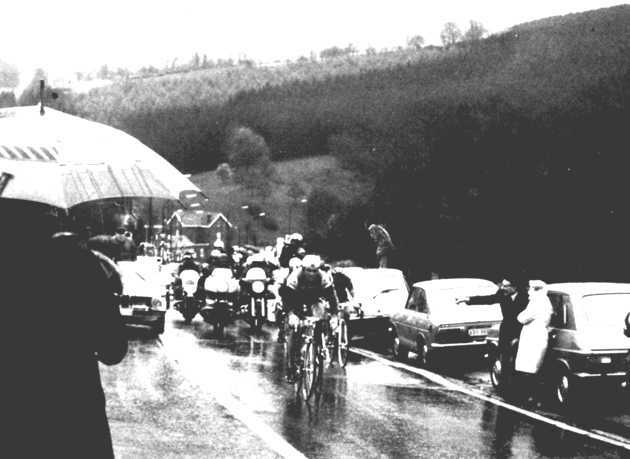 If one can describe efforts such as these in facile terms, then Dietrich Thurau appeared to me to be the most at ease, but then everyone seemed to overlook the presence of Bernard Hinault as he responded to every thrashing that the Belgian Masters handed out. The Kings Men were brought back, and Thevenet and Verbeeck seen off for good. After six hours of cruel battle, with another 30 minutes to go, the skies darkened over Liège. The rain, hail, and wet snow lashed down to provide a fitting, if extremely unwelcome and uncomfortable, finish to this hellish competition. 21 year old Hinault powers through the rain en route to winning his second classic in just five days. "Cyrille Guimard drove alongside to ask if I was alright, and I told him that I was really flying, I could hardly feel the pedals. Guimard then told me that if things continued as they were going, and it came to the sprint, for me to go first, then ease, and then kick through again. For several kilometres, until we came into the Liège limits, I didn't relay the Belgian, whom I considered to be much stronger than I, having already two wins in the Fleche Wallonne under his belt. However, when I finally realised that we were really out on our own for good, then I did my part to the full". "My top gear was just smaller than Dierickx' and I would have to push a 53 x 14 whilst the Belgian could drop onto a 13-sprocket. However, in the time it took for Dierickx to change up I was off and away. I couldn't see any finish banner, just that the passage narrowed down and I could see all the photographers at the far end... then I knew that I'd got it. Thanks to Guimard!" Dierickx himself said that he didn't know if Hinault could sprint (how many times have we heard that statement?) and that he had made the mistake of sprinting from too far out, after doing too much work beforehand. Quite honestly I think that he had completely underestimated Hinault's ability to withstand six-and-a-half hours of intense competition, and then have enough guile and strength to dominate him in the sprint. Merckx's comments were those of a true Belgian who has been thoroughly disgusted and amazed at what went on in the final stages of the race. "The two who were out front shouldn't have been there at all. Please explain to me why nobody would work properly whilst Thurau was away? Above all, Maertens? And it was the same thing when Hinault jumped on Dierickx's wheel. Really, I don't understand Maertens. If he had worked with us normally we'd have easily got them back, and he would have been odds-on for the sprint. It was obvious that he didn't want that... and I'd like to know why!!" However, the Classic results have been somewhat satisfying all round, with Belgium retaining three, Holland and France taking two each... only the Italians missing out completely. Bernard Hinault will not ride the Tour de France because of his age. And if you think that that is rather odd, just remember that Raymond Poulidor didn't tackle the Tour until he was a year older than the Breton White Hope. And have the French found a New Saviour ? 2 Andre Dierickx (Maes-Pils) s.t. 6 Merckx (Fiat) all st.
10 Bruyere (Fiat) all s.t.